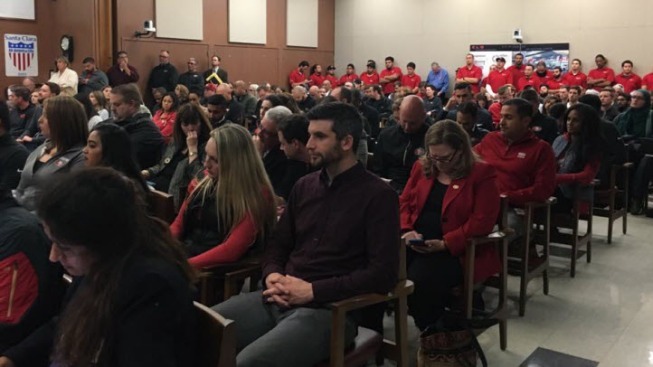 49ers supporters attend the Santa Clara City Council meeting. The ugliness continued with the San Francisco 49ers. In Tuesday night's case, however, it was not on the field; it was at Santa Clara City Hall. During the City Council meeting, the team was put on notice. Mayor Lisa Gillmor doesn't think the city is getting its fair share of revenue from Levi's Stadium. She requested the 49ers provide all the financial documents, as part of their lease agreement. If the team refuses, Gillmor has said the city may hire an outside entity to run stadium operations or "hire someone elese." The 49ers responded with a statement, saying they're working with a third-party auditor to provide the documents. "Just look at the contract, give us what's required in the contract for the last two and a half years," Gillmor said to an audience packed with 49ers supporters in red. Also the Stadium Authority, which is made up of city council members, voted to give the 49ers one week to provide the documents. 49ers executives and attorneys at the meeting said they have invited the auditor and stadium authority members to view them at their offices, and are coordinating a time to meet this week. 49ers outside counsel Harry O'Brien said the contract contains "sensitive information regarding the security systems for the stadium, and it is not appropriate to be in the public realm." The team reiterated it does not want to make the documents public because that proprietary information could cost the team and city revenue from competing promoters. “The San Francisco 49ers organization has been subject to a campaign of misinformation and headline-grabbing accusations, most recently in regard to the management of Levi’s Stadium. Contrary to these rumors and reports, the 49ers have not breached any agreements with the City. Rather, Levi’s Stadium, under 49ers management, has proven to be a tremendous economic and cultural asset not only to the City but also the entire region, while returning millions of dollars of revenue to Santa Clara. “Until recently, we have remained largely silent, hoping our performance would speak for itself. The Mayor fails to recognize that her unfounded accusations are harmful to her city and constituents. It is they who stand to lose revenues if promoters and event planners believe there is instability in the management of Levi’s Stadium. “Contrary to the Mayor’s recent statements to the press, she has no right to terminate the 49ers as manager of Levi’s Stadium. Her unjustified threat to remove the 49ers has unnecessarily created a fear of job loss in the many employees who have worked so hard on behalf of the Stadium Authority to make Levi’s Stadium so successful in such a short time. The 49ers will continue to manage Levi’s Stadium in the world-class manner that has already garnered the venue and the City of Santa Clara international recognition. “The 49ers have cooperated fully with the Mayor’s financial consultants. We have responded to all questions asked and have either provided copies of the requested documents, or, where confidentiality is a concern, we invited the consultants to review the requested information in our offices.